William Golding’s masterwork “Lord of the Flies” is one of the greatest pieces of literature ever written. Lord of the Flies, the film, is an adaptation of the novel from 1963 by a mostly theater director by the name of Peter Brook. The film was a critical success and shocked many movie-going audiences at the time. Lord of the Flies tells the tale of thirty British school boys who survive a plane crash and are stranded on an island together. Marooned with no hopes of being rescued, they attempt to take care of themselves in the best ways that they know how. As their group splits into different factions, their primal instincts emerge and anarchy begins to take them over. The film, and the novel, play with themes of society and how a set of circumstances can lead human beings down the dark and winding path towards self-destruction. For its time, the film was very raw and almost documentary in style. It was so different from anything else being made at the time that it shook up many of the people that saw it. How does it hold up today? Well, both the novel and the film are a bit of beasts on their own, separate from each other, but it’s basically the same story in both versions. While the film does show its age a bit, it does feel a like an ancient documentary at times rather than a film, which might not appeal to everyone today. Looking back on it, and when it was made, it’s a wonder that it exists at all. It was a tough film to get to made in the late 1950’s, so the filmmakers’ approach was to get away from both Hollywood and the studios of Britain. It was an attempt to a capture a documentary-like feel to the material. For this reason, the performances from the children, for the most part, are naturalistic and feel very real. The film overall is a bit on the dated side, particularly with the score, but the raw emotion is still there. It may be a little rough around the edges but it still has a lot of staying power. For the film’s debut on Blu-ray, Criterion has done another stellar job. While it isn’t perfect, it’s probably the best the film has ever looked on home video. It’s also a dramatic improvement over Criterion’s original DVD release of the film. There’s a healthy amount of film grain on display, with only a slight wobble to the image that most people probably won’t notice except on white backgrounds. The credit sequence is actually the roughest looking portion of the film due to the many transitions and credit overlays, but once the film begins, it’s a terrific looking image. Blacks and whites are both very strong, and brightness and contrast are nearly perfect. The film is pretty old and in rough shape, but thanks to this new 4K transfer, which was supervised by the editor and cameraman on the film Gerald Feil, the quality is superior to anything that’s come before it. For the film’s audio, the original English mono soundtrack has been utilized, uncompressed. It definitely shows its age, and being that the film uses a combination of production audio and obvious overdubbing, the mono track just can’t seem to handle it all perfectly. That’s not to say that it’s a bad track. It isn’t, but it doesn’t hold up to close scrutiny. Sound is sometimes muddled because of all the different things happening on the screen at one time, but there are also some nice quiet patches with clear and precise dialogue. There isn’t much LFE output from the track either, so while it’s definitely a faithful restoration to the original soundtrack, some may find it a bit too flawed. Personally, the flaws seem to go hand in hand with the rawness of the film itself, but that’s just me. There are also subtitles in English for those who need them. For the extras, there’s a good assortment to look through. There’s an audio commentary with director Peter Brook, producer Lewis Allen, director of photography Tom Hollyman and camerman/editor Gerald Feil; audio recordings of William Golding reading from the novel with accompanied scenes from the film; a deleted scene with optional commentary and Golding reading; an interview with Brook; Behind the Scenes material (Home Movies, Screen Tests, Outtakes and some stills); an excerpt from a 1980 episode of The South Bank Show featuring Golding; an interview with Feil; an excerpt from Feil’s 1973 documentary The Empty Space; the Living Lord of the Flies documentary; and finally, a 28-page booklet with an essay by film critic Geoffrey Macnab and an excerpt from Brook’s autobiography The Shifting Point. Overall, this is another quality release from, in my estimation, the reigning kings of proper home video distribution. 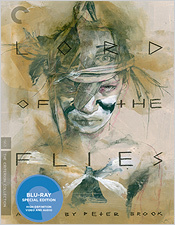 Lord of the Flies is still a terrific film and Criterion’s treatment of it is excellent, so it’s well worth your time.